When using hoop nets for lobsters, when you pull up a lobster you are required to immediately measure it to make sure it meets or exceeds the minimum requirement of Three and one-fourth inches measured in a straight line on the mid-line of the back from the rear edge of the eye socket to the rear edge of the body shell. When I measure lobsters, I prefer it to be at least a quarter inch or more over the minimum size to be safe in case the gauge I'm using is off by a sixteenth of an inch or so. 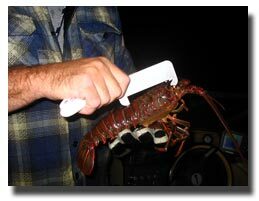 I also HIGHLY RECOMMEND measuring your lobster gauge with an accurate measuring device like an accurate ruler, dial calipers, machinest die rule or the like before using it to verify the opening size. 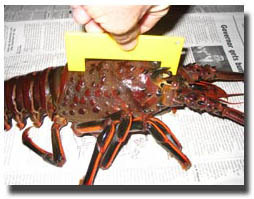 Inexpensive lobster gauges made from plastic and aluminum are often off in their measurement, so it's best you know BEFORE using it if it's accurate or not.